How to make virtual education work best. Holly Mortimer teaches for three online schools from her home in Boise, Idaho. Good teaching is good teaching whether it happens in a classroom or on a computer screen (or in a house, or with a mouse, or in a box, or with a fox, for that matter). That said, there's more to effective online education than simply dropping a good face-to-face teacher into a virtual classroom. The tools and techniques for engaging students, delivering content, and building relationships should be deployed differently online. "The key shift for an online teacher is to go from the paradigm of thinking about what you're going to teach and how you're going to teach it to what the kids are learning and not learning," says Boise, Idaho-based Holly Mortimer, who taught in a brick-and-mortar school before becoming an online teacher and who now works for three different schools. She notes that because most online content is created for the teacher in advance, "the focus totally shifts from the content to the student." The following tips are compiled from interviews with online principals and teachers in Idaho, including Mortimer; Jeff Farden, an online principal with the Idaho Digital Learning Academy (IDLA); Mike Caldwell, director of supervision and development with IDLA; and social studies specialist Jeff Simmons, also of IDLA. Kerry Rice, assistant professor and associate chair of the Department of Educational Technology at Boise State University (BSU), contributed as well. Also, be sure to check out these comprehensive downloadable tips from Lisa Dawley, chair of the Department of Educational Technology at BSU. Just because online learning happens at a distance doesn't mean it's impersonal. Use text or voice chats to converse with your students and encourage them to converse with one another. Even during a lecture, you can use tools such as real-time polls or simple check boxes for "agree" or "disagree" or "understand" or "don't understand" to involve students and adjust your lesson to their comprehension. 2. Let students pace themselves. Give them control of their lesson materials. Students should be able to access the content -- read articles, play videos, do practice questions, replay recordings of live lessons -- at any time. That way, they can spend extra time on lessons if needed, or they can speed ahead. Still, it's important that they have a few big-picture, benchmark deadlines in mind to keep them on track to finish the course. Quick responses to students' emails and prompt feedback on assignments are your way of being present in an online classroom. "Without this," Mortimer says, "kids feel like they're just in the wilderness with this cold set of curricula." IDLA actually requires teachers to reply to students' emails within 24 hours. Your communication with your students shouldn't be stiff or formal just because you're doing it in writing. Be conversational. Let your personality out. Teacher trainers at IDLA suggest that you practice by typing a note to a student and then reading it out loud to see if it sounds like something you'd actually say. 5. Make the most of the medium. Working online means you can deploy all kinds of media -- images, video, animations, graphics, audio, games -- to deliver content, enhance students' understanding, and make lessons more engaging. Just make sure you choose media that serve the lesson, not the other way around. Students will engage more if they get the chance to connect with each other, academically and socially, but this can be challenging to do online. Try giving assignments that demand collaboration. And let them chat. After a live lesson, Mortimer often leaves the session open for 15 minutes to let students chat socially while she keeps an eye out to make sure they keep it appropriate. 7. Conduct live meetings only as necessary. Rice explains, "A lecture delivered online will be less effective than one done in a face-to-face classroom. Students are more likely to be distracted. Save real-time meetings for activities that require discussion and interaction." The rest of your teaching can be done asynchronously, with each student signing on to learn at her own chosen time. 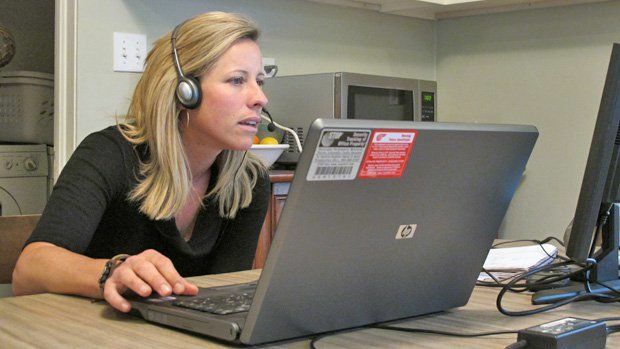 Online teaching can be isolating. Join a professional learning community -- such as Edutopia's Technology Tools and Online Resources group. We hope you'll join us there! -- or visit regularly (whether in person or via instant messaging and email) with other teachers in your school or program. 9. Manage your time well. 10. Have a real-life adult helper in the room. If you're doing online learning in a school building as part of the students' regular course load, be sure there's a teacher's assistant or another trained professional present to foster a productive work environment, to handle technical glitches, and to help students stay on track. IDLA CEO Donna Hutchinson describes this person as a combination "den mother and drill sergeant." It's great for kids to learn self-direction through their online courses, but we all know they sometimes need a little nudge.